Identity Management unifies disparate yet related Linux services into a single management environment. From there, it establishes a simple, easy way to bring host machines into the domain of those services. An IdM server is, at its core, an identity and authentication server. The primary IdM server, essentially a domain controller, uses a Kerberos server and KDC for authentication. An LDAP backend contains all of the domain information, including users, client machines, and domain configuration. Other services are included to provide support for the core identity/authentication functions. DNS is used for machine discovery and for connecting to other clients in the domain. NTP is used to synchronize all domain clocks so that logging, certificates, and operations can occur as expected. A certificate service provides certificates for Kerberos-aware services. All of these additional services work together under the control of the IdM server. The IdM server also has a set of tools which are used to manage all of the IdM-associated services. Rather than managing the LDAP server, KDC, or DNS settings individually, using different tools on local machines, IdM has a single management toolset (CLI and web UI) that allows centralized and cohesive administration of the domain. Kerberos is an authentication protocol. Kerberos uses symmetric key cryptography to generate tickets to users. Kerberos-aware services check the ticket cache (a keytab) and authenticate users with valid tickets. Kerberos authentication is significantly safer than normal password-based authentication because passwords are never sent over the network — even when services are accessed on other machines. In Identity Management, the Kerberos administration server is set up on the IdM domain controller, and all of the Kerberos data are stored in IdM's backend Directory Server. The Directory Server instance defines and enforces access controls for the Kerberos data. The IdM Kerberos server is managed through IdM tools instead of Kerberos tools because all of its data are stored in the Directory Server instance. The KDC is unaware of the Directory Server, so managing the KDC with Kerberos tools does not affect the IdM configuration. Identity Management contains an internal 389 Directory Server instance. All of the Kerberos information, user accounts, groups, services, policy information, DNS zone and host entries, and all other information in IdM is stored in this 389 Directory Server instance. When multiple servers are configured, they can talk to each other because 389 Directory Server supports multi-master replication. Agreements are automatically configured between the initial server and any additional replicas which are added to the domain. Kerberos can use certificates along with keytabs for authentication, and some services require certificates for secure communication. 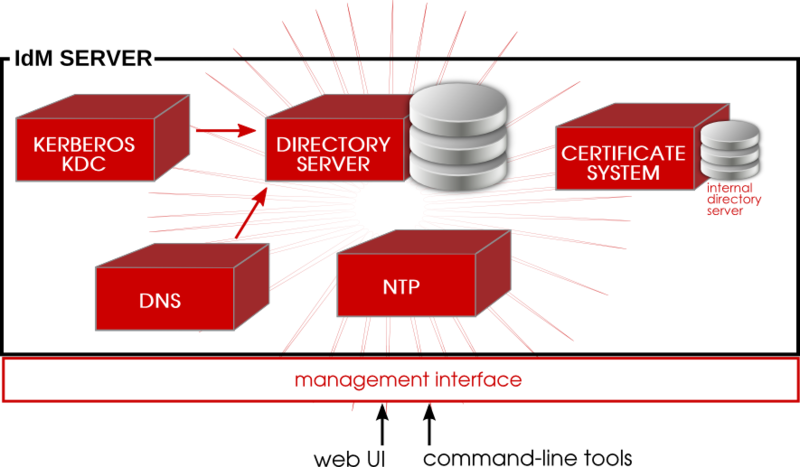 Identity Management includes a certificate authority, through Dogtag Certificate System, with the server. This CA issues certificates to the server, replicas, and hosts and services within the IdM domain. The CA can be a root CA or it can have its policies defined by another, external CA (so that it is subordinate to that CA). Whether the CA is a root or subordinate CA is determined when the IdM server is set up. Identity Management defines a domain — multiple machines with different users and services, each accessing shared resources and using shared identity, authentication, and policy configuration. The clients need to be able to contact each other, as IdM servers. Additionally, services like Kerberos depend on hostnames to identify their principal identities. Hostnames are associated with IP addresses using the Domain Name Service (DNS). DNS maps hostnames to IP addresses and IP addresses to hostnames, providing a resource that clients can use when they need to look up a host. From the time a client is enrolled in the IdM domain, it uses DNS service discovery to locate IdM servers within the domain and then all of the services and clients within the domain. The client installation tool automatically configures the local System Security Services Daemon (SSSD) to use the IdM domain for service discovery. SSSD uses DNS already to look for LDAP/TCP and Kerberos / UDP services; the client installation only needs to supply the domain name. SSSD service discovery is covered in the SSSD chapter in the Red Hat Enterprise Linux Deployment Guide. On the server, the installation script configures the DNS file to set which services the DNS service discovery queries. By default, DNS discovery queries the LDAP service on TCP and different Kerberos services on both UDP and TCP. The DNS file which is created is described in Section 17.2, “Using IdM and DNS Service Discovery with an Existing DNS Configuration”. While it is technically possible to configure the IdM domain to use DNS service discovery without having an IdM server host the DNS services, this is not recommended. Multiple DNS servers are usually configured, each one working as an authoritative resource for machines within a specific domain. Having the IdM server also be a DNS server is optional, but it is strongly recommended. When the IdM server also manages DNS, there is tight integration between the DNS zones and the IdM clients and the DNS configuration can be managed using native IdM tools. Even if an IdM server is a DNS server, other external DNS servers can still be used. The System Security Services Daemon (SSSD) is a platform application that caches credentials. Most system authentication is configured locally, which means that services must check with a local user store to determine users and credentials. SSSD allows a local service to check with a local cache in SSSD; the cache may be taken from any variety of remote identity providers, including Identity Management. SSSD can cache user names and passwords, Kerberos principals and keytabs, automount maps, sudo rules that are defined on IPA servers, and SSH keys that are used by Identity Management domain users and systems. This allows two significant benefits to administrators: all identity configuration can be centralized in a single application (the IdM server); and, external information can be cached on a local system to continue normal authentication operations, in case the system or the IdM server becomes unavailable. SSSD is automatically configured by IdM client installation and management scripts, so the system configuration never needs to be manually updated, even as domain configuration changes. Consistently with Windows Active Directory, SSSD allows the user to log in with either the user name attribute or the User Principal Name (UPN) attribute. SSSD supports the true, false, and preserve values for the case_sensitive option. When the preserve value is enabled, the input matches regardless of the case, but the output is always the same case as on the server; SSSD preserves the case for the UID field as it is configured. SSSD allows certain cached entries to be refreshed in the background, so the entries are returned instantly because the back end keeps them updated at all times. Currently, entries for users, groups, and netgroups are supported. Many services require that servers and clients have the same system time, within a certain variance. For example, Kerberos tickets use time stamps to determine their validity. If the times between the server and client skew outside the allowed range, then any Kerberos tickets are invalidated. Clocks are synchronized over a network using Network Time Protocol (NTP). A central server acts as an authoritative clock and all of the clients which reference that NTP server sync their times to match. When the IdM server is the NTP server for the domain, all times and dates are synchronized before any other operations are performed. This allows all of the date-related services — including password expirations, ticket and certificate expirations, account lockout settings, and entry creation dates — to function as expected. The IdM server, by default, works as the NTP server for the domain. Other NTP servers can also be used for the hosts.